Creating jewelry lines is a long-term investment of a jewelry maker's time, materials and artistry. 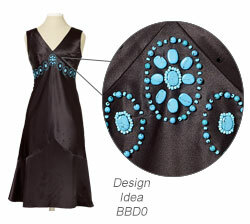 Yet styles and trends can change quickly, inflating the costs of your creations. Protect your bottom line by cutting down the time you take to make this year's styles ready for next year. There are essentially three groups of updating techniques you can use for your jewelry lines: Surface, Shade and Structure. Keep your costs under control with these and other handy tips for helping your jewelry lines transition from trend to trend and season to season. You can quickly move jewelry lines through seasonal trends by changing the surface appearance. While the summer trend may be polished metals, winter can be all about antiqued finishes. Turn summer's jewelry lines into winter's with antiquing solutions like Liver of Sulfur™, Patina Gel and Gilders Paste®. Add sparkle with Swarovski flat backs, translucent images and letters with image transfers like Lisa Pavelka's Waterslide Transfers and Omni-Gel™ liquid, add opaque images with a coating of Mod Podge® and increase shimmer and shine with metal leaf and craft foils and mica powders. You can quickly move jewelry lines through seasonal trends by changing the shade, hue and color of your components. Tune in to our Jewelry-Making Trends for the latest information on upcoming colors. Sometimes, you may need to simply replace the beads, pendants or focal components with the latest season's colors. If you design with removable bails, it's easy. Just unlatch the bail, switch out the pendant, close it back up and you're ready to go. 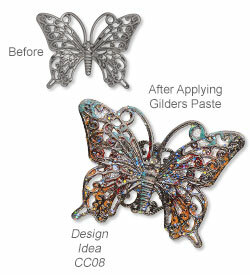 Use Gilders Paste to overlay color on metal, wood, baked polymer clay, ceramic, leather and other components. Paint colors onto plain metal beads, pendants and components using Vitrearc© and Thompson enamels, enamel multipens and Pebeo glass and porcelain paints. 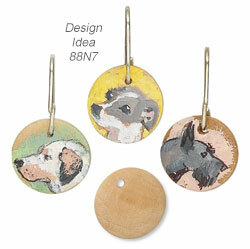 Fire enameled metal pieces in a kiln or bake painted porcelain in a toaster oven. Trends turning minimalist? 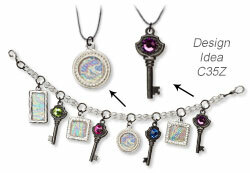 Remove multiple charms, pendants, drops and focals from your current jewelry line. String individual pieces on chain or cord and you'll create a swath of finished pieces easily! Here's the other side: minimalist trends eventually grow more complex. Just reverse the simplification process and take those separate charms, pendants, drops and focals--or single-strand jewelry pieces--and collect them into themed pieces. Single-strand bracelets can easily turn into multi-strand necklaces by hanging them from a side station or focal component. You can even make them interchangeable for even more trend flexibility. It's an easy way to create jewelry sets, too! Restringing can update a look without a large investment of artistic time while allowing you to update your work easily. You don't need to re-design--just restring! Beads strung on thread can now go onto beading wire like Accu-Flex®. Beads with generous holes can be strung on chain or cord. Bead stringing as a jewelry trend tends to follow a ''The Seven Year Stringing Cycle''. Turn a multi-strand necklace into a multi-strand bracelet or multi-bracelet set. Just cut away the multi-strand necklace clasp, pull off some of the strung beads, attach a bracelet clasp and you're ready to go! A longer single-strand necklace easily becomes a wrap bracelet. When jewelry styles change significantly, length is often part of the reason as well as being part of the solution. Add chain or cord to the ends of a short necklace in order to create a long one--or go the opposite way and shorten an opera-length necklace into a shorter, on-trend style. Think outside the box entirely: sew jewelry pieces on to clothing [ BBD0, CABZ, CAC0 and B92G], turn necklaces into purse straps [ DC1T and 820T], attach bracelets or chokers to shoes [ C22B and 88TK], put brooches on headbands [ D70Q, BA6J and BA6F] and more. 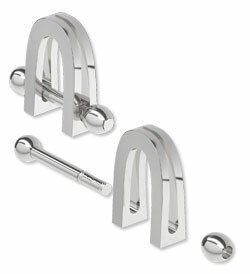 Accessories trends ebb and flow, too! Use removable bails and Screw-Tite Crimps™ to make replacing components easier. End strung lengths with lobster claw, springring or toggle clasps to easily attach and detach strands from multiple-strand designs. Read and view our Jewelry-Making Trends for the latest information on the coming jewelry-making season. Keep an eye on the runways and catwalks, check out street style photos and stay aware of what’s happening in entertainment to help you see both major and niche trends. Book series and movie franchises, especially those with a wide female audience, generate fashion trends of their own--just look at the jewelry that came from the Harry Potter, Twilight and Alice in Wonderland films! Learn to create your own components from wire, metal clays, polymer clays and other materials so you can create the specialty components or imagery you want--especially if you’re working with niche or micro trends. Why wait on someone else making exactly the charm you want, when you could be leading the charge?